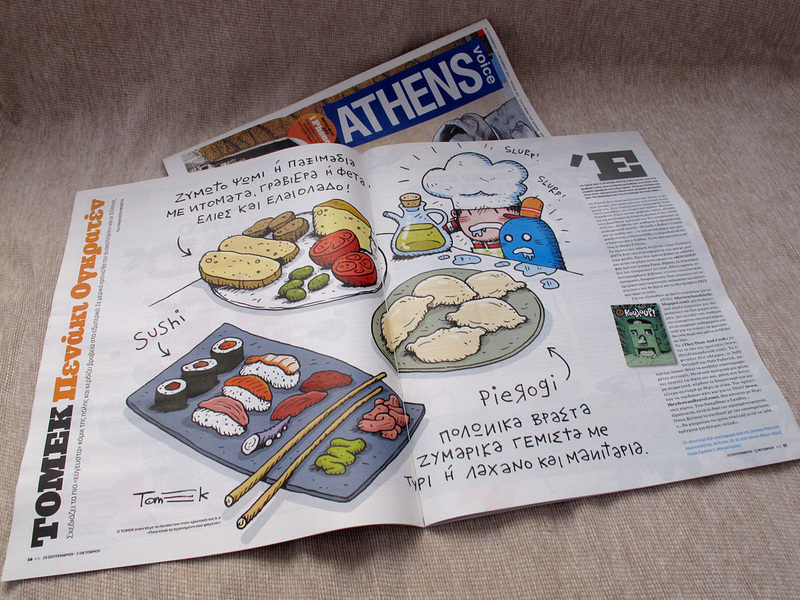 On Thursday, September 29 in the issue #362 of the free press ATHENS Voice, is a tribute to me and my work. There is an extensive reference to my Comic Books and the illustrated recipes I made for TDAC. The whole article you can read on the website of ATHENS Voice here. It is also available online as PDF and ISSUU. Awesome Tomek!!!! I think I could exist on tomatoes, bread, feta and olives til eternity especially if I were living on Skiathos!!!!! Thanks so much for keeping TDAC and TDAT lively and fun! Παιδια plz βοήθεια!! Πως γινεται να κανω αναίρεση διαγραφης των αναρτησεων?? Whoa, Tomek, this is awesome! That is a sweet full-spread illo. Nice, nice, nice! I didn't expect they will print it as full-spread. It was nice surprise!